I wanted to make another canning recipe but noticed this beverage instead. I felt like making something fun so I’m trying the Lemon or Ginger Nectar recipe that Mrs. D. Howell contributed for the 1898 New Galt Cook Book. As usual I’m cutting these large recipes down to a manageable size. I weighed 2 pounds (4 cups) of sugar and put it in a saucepan with 1 quart (4 cups) of water. I boiled it so that it was a syrup and then removed it from the heat. I let it cool and added 1 ounce (1 package) of tartaric acid. In the past I thought cream of tartar could be substituted for tartaric acid but the effect is not the same. Hunt for tartaric acid in wine making stores or places that carry that sort of ingredient. I live in a neighbourhood full of corner stores selling supplies for home wine makers with roots in various European countries but I find tartaric acid most easily in wine stores. The next instruction is a bit confusing. The title says Lemon OR Ginger but the body of the recipe seems to indicate adding both. I’ve decided to go with the title and just use 1 ounce (2 tablespoons) lemon extract although the combination of lemon and ginger could be intriguing I don’t have ginger flavouring. I imagine it is available but I haven’t noticed it. I added the flavouring and then separated 1 egg. Again the recipe doesn’t say to whip the egg white but all the other recipes of this type talk about whipped egg whites. I whisked it and then added it to the other ingredients. It was time to try it. I filled a glass half way with water and then topped it with the nectar. I stirred it and then added about 1/4 teaspoon of baking soda and watched it foam up. Time to drink. Mrs. D. Howell is probably Sarah Louise Spencer. She was born in 1829 in England but must have been in Canada by 1850 when she married Daniel Howell. Their first child a daughter named Mary Alice died when she was eight months old. Their son Harry out lived his parents, but not by much. He died in his 50’s when he accidentally shot himself while cleaning his rifle. People who handle firearms will have a better idea about whether that is easy to do or not. He’d had an adventurous life meeting his wife in Australia. His parents Sarah and Daniel spent most of their lives in Galt Ontario where Daniel was a manufacturer. He died in 1889 so Sarah was a widow when this recipe appeared. Sarah was 80 when she died. Mrs. D. Howell’s Lemon Nectar is fun. The foam really lasted but the lemon flavour is the typical extract type. It’s okay but the versions made with real lemon juice tasted better. I guess the extract would be okay if the real thing isn’t available. I’m also very curious about the ginger variety. The full recipe makes a huge quantity so try making a smaller amount and for safety use pasteurized egg whites (available in cartons near the eggs). Boil four pounds of sugar in two quarts of water, when cool add two ounces tartaric acid, two ounces essence of lemon, two ounces essence of ginger. whites of two eggs. If to effervesce add a little soda when used. I decided to try another of these egg based drinks tonight. I have a summer cold so the lemon and extra liquid might be helpful. I buy the tartaric acid in small pouches at a make your own wine store. One packet is 1.75 ounces so I used just under half the packet. I also weighed the sugar to get 1 pound (about 2 1/4 cups). I mixed these two things in a large measuring cup and added 1 lemon cut up. I chose to cut it in slices but you could make the pieces smaller. Next I separated 4 eggs and added the whites to the rest. Finally I added 1 quart (4 cups) of boiling water. I stirred everything together and prepared to make a glass to sample. Mrs. W. B. Wood of St. George is probably Ellen Elizabeth Malcolmson. She married William Bruce Wood in 1872 when she was about 19 and he was 24. Elizabeth had been born in Niagara while W.B. was from Scotland. The couple had three or four children (depends if Nellie and Ellen are the same person). Mr. Wood had quite the career as a miller and politician. He was mayor of Brantford and eventually the president of Dominion Mills in Montreal. It was there that both William and Ellen died when they were around 80 years old. Their two daughters were living with them well into their 40s. Their youngest child a son married and must have had an interesting life as he died in Singapore in his 70s. 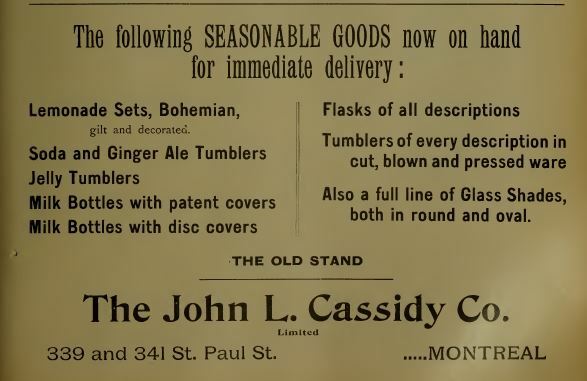 Ad for Glasses and Beverage Servers in The Canadian Grocer summer 1898. This drink is so simple and quick and surprisingly good. I truly didn’t expect it to work based on the instructions and yet the sugar melted and the lemon flavour seeped out into the rest of the ingredients. I added 4 tablespoons to a large glass and added some cold water. Then I stirred in some baking soda. It foamed up and almost overflowed but it looked amazing. I took my first sip and realized I’d added a bit too much soda because at first it tasted like a baking soda and water antacid mixture. But then I got the tart lemon and tartaric acid and it was refreshing but the creamy foam makes it different from lemonade. Drinking this sort of foamy old-fashioned drink makes me feel like I’m in an old movie at a drugstore soda fountain with Mickey Rooney and Judy Garland. I can’t imagine this drink being bottled today. Not only would you miss the exciting moment when it starts to foam but I suspect the raw egg whites would be a problem. If you’d like to step back in time and don’t mind the risk of consuming a bit of raw egg white then give this a try. In the modern world you don’t even have to turn on the stove. Just boil the electric kettle and make yourself a Lemon Cream! One ounce of tartaric acid, one pound white sugar, whites of four eggs, cut up one lemon. Stir all together and add one quart boiling water. Put three or four tablespoonfuls of this mixture in a glass, fill up with cold water, add a little soda before drinking. This makes a nice summer drink. But do not make it in a tin vessel. 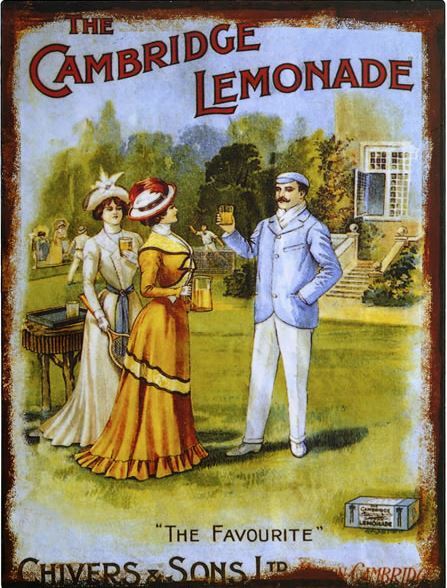 British advertisement for Cambridge Lemonade. It was hot today. A perfect day for lemonade! There are two recipes for Lemonade in The New Galt Cook Book (1898). I made one on day 151 so I’m going to try the other one tonight. No one is given credit for the recipe just like the previous recipe for this old favourite. However, I’ve never run across a recipe for lemonade that used the peel, unless as a garnish, so I’m very curious how this will taste. I decided to make half the recipe so I pared thin strips of rind from 1 washed lemon. I put the rind into a glass and weighed the granulated sugar. I added 1 ounce (2 tablespoons) of sugar to the glass and then poured 1/2 pint (1 cup) of boiling water. Next I squeezed the juice from the lemon and added it to the glass. I let it cool a little and then strained it before putting it back to cool. I had to use a fridge for cooling but the most historically accurate option would be to put it on ice purchased from the local provider. This is a wonderful version of lemonade. The lemon flavour is intense and the balance of sweet with sour is perfect. It would be more time-consuming to make a large amount but making the full recipe will give you two glasses of perfect lemonade — one for you and one for a friend to sip on the porch. For good lemonade the right proportion is two lemons to a pint of boiling water. Peel the yellow rind off very thinly, add two ounces sugar, pour over the boiling water, add the juice of the lemon, strain, cool and serve. I have one quart of strawberries left so I’m going to start a recipe that is very very familiar to me. Normally I’d wait to report on the results but the anonymous recipe for Strawberry and Raspberry Shrub in The New Galt Cook Book (1898) is one I made nearly every year while working in an 1891 historic home. I worked most Saturdays there and it was an easy recipe to make while talking with visitors. It takes nearly a week to complete so it provided lots of interpretive opportunities. The process also smells and looks interesting. I’ve always used strawberries since raspberries are usually more expensive and arrive later in the season. 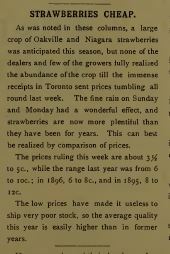 Based on information in The Canadian Grocer magazine in June 1898 the weather was perfect for strawberries and they were available in abundance at a lower cost than the previous year. The first step is to hull the strawberries. I’m going to make just a quarter of the recipe so I’m going to use just 1 quart of strawberries. I cut the strawberries into chunks and put them in a bowl. I poured just enough regular white vinegar to cover the berries. I once used pickling vinegar and it was just too strong for this recipe. Now it is time to let the berries sit for two days. I plan to leave the bowl out on the counter rather than refrigerate it. A modern cook could cover the top of the bowl with some Saran wrap and put it in the fridge but in historic settings I always use a bit of waxed paper and a tea towel so that flies don’t get in and just leave it on the table. I learned early not to put just the tea towel on top as it always seems to end up stained red with berry juice. It must sit for two days (48 hours) and soon I’ll smell the combination of strawberries and vinegar. After two days I have to strain out the berries and put another quart of berries into the now pink strawberry flavoured vinegar. The used berries unfortunately have to become compost. They are just too filled with vinegar to be usable for anything else. All the wonderful strawberry flavour leaches into the vinegar. The second round of berry soaking is another two days (48 hours). Again the berries are removed and it is time to turn the strawberry flavoured vinegar into a beverage syrup called a shrub. When sharing this recipe with visitors there was always confusion over the term “liquor”. This is not an alcoholic beverage. It doesn’t ferment and there is no liquor in it. Instead this simply means “liquid”. I measure the liquid and since I’m making just a quarter recipe I know that I won’t have the full pint (2 cups) of liquid so I’ll need less than a pound of sugar. The proportion is more likely to be 1/2 cup of liquid and just over 1/2 cup of sugar. You’ll note the recipe recommends a porcelain lined kettle for boiling the sugar and vinegar. Today you can use any pot that won’t react to the vinegar but if you want to recreate the 1890s then use a graniteware saucepan often available in hardware or camping supply stores. 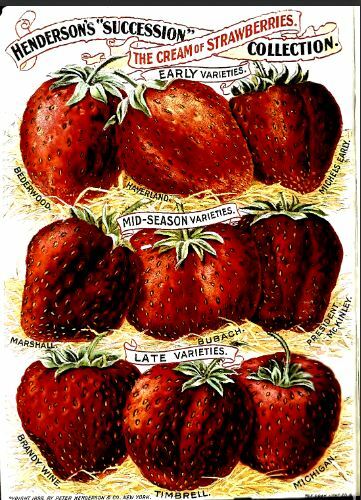 Strawberry Illustration circa 1898 – Peter Henderson Co. Boil the sugar and vinegar for 10 minutes and put in a bottle or jar and it is ready for use — just don’t taste the syrup on its own. It is very vinegary but tastes good combined with plain or soda water and staff at the historic house discovered that a tablespoon in a glass of lemonade makes a delicious variation of “pink lemonade”. Experiment with the amount of shrub to add to your beverage. It really depends on the size of your glass and personal taste. I always made sure to stash a small bottle of this beverage syrup away in the back of the pantry. Then in November and December I would remove the cork for visitors to smell the contents. There is nothing like a whiff of strawberry shrub on a cold winters day to transport you back to summer. Today we are accustomed to seeing strawberries in stores year round but this treat was much more short-lived in 1898. Freezing them wasn’t an option for homes so finding other ways to preserve them led to all sorts of methods including this beverage syrup. On four quarts of berries pour white vinegar enough barely to cover them. Let them stand for forty-eight hours, then drain off the vinegar, squeezing the juice out of all the fruit with the vinegar. If strawberries are used, the vinegar must be poured over a second supply of the fruit before it will attain the proper flavor; but one supply of raspberries is sufficient. Measure out the liquor when it is ready, and to every pint allow a pound of sugar. Put it in a porcelain-lined kettle with the sugar and let boil for ten minutes, en bottle it and set it away in a cool place. A cupful of this syrup is sufficient to flavor a quart of ice water. I’m going to try another recipe from the Drinks section of the 1898 New Galt Cook Book. I can’t imagine that Tarragon Vinegar is meant as a drink but rather as a flavoured vinegar much like the other two I’ve tried this year. Again this recipe doesn’t have anyone claiming it. I’ve been planning to make this recipe on a very hot day since it doesn’t require cooking but it is also on my mental list of recipes to make when I need a simple recipe. Tonight is one of those nights. I didn’t have a cup of tarragon leaves so I’m making one-quarter of the recipe. I bought my tarragon since I don’t have any in my garden although I do have lots of lemon balm, mint and chives all of which I’ve used to make vinegar over the years. I stripped the leaves from the tarragon stems and had about 1/4 cup. I put them in a bottle and added 1 cup (1/4 of a quart) of cider vinegar. I corked it and I’ll let it sit for the two weeks recommended in the recipe. I tasted it tonight and I’ll taste it again when it is ready. Tonight the tarragon vinegar tastes mainly of cider vinegar but I’m sure that the tarragon flavour will slowly soak into the vinegar. Tarragon has the flavour and aroma of licorice or anise. I’m not sure how I’ll use the vinegar since I don’t really like the taste of licorice. I’m hoping there is a recipe in the cook book that uses it but I can imagine it as part of a salad. One cupful leaves, one quart cider vinegar. Place these together in a bottle, cork and stand aside for two weeks, shaking frequently. Stain through a flannel bag and pour in small bottles, cork tightly and keep in a cool place. After making 140 different recipes in The New Galt Cook Book (1898) I seem to have “hit the wall” and so tonight I’m learning How to Make Tea. Not surprisingly there is no contributor mentioned with the recipe. I’m always surprised when cook books include recipes for such basic things. I’m never sure if they are used as space fillers or if truly there were people who needed this sort of recipe. I can imagine that today such a recipe might be needed but in 1898 I’d assume that most women would have learned to make the traditional beverage, especially in a Scottish community like Galt Ontario. I poured some boiling water in a teapot to scald it and then added 4 teaspoons of tea and 3 cups of boiling water. 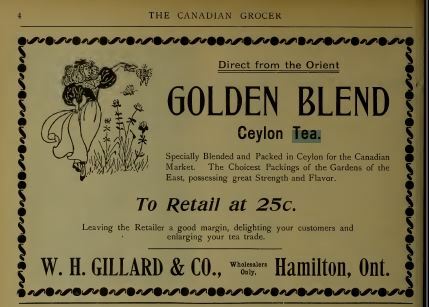 The most appropriate tea would be black loose leaf from one of the countries mentioned in the ads below but it turned out that all my loose leaf were various blends or types that would not be around in 1898. I finally found a packet of leaves labelled Scottish Breakfast Tea so that seemed appropiate for Gal. I put the teapot under a tea cosy and let the tea infuse for three minutes before tasting. I left the rest in the pot for the suggested ten minutes and tasted again. One of the interesting details was to pour the tea into another teapot so that the liquid was off the tea leaves once it was strong enough. This is a great idea that I didn’t follow this time. 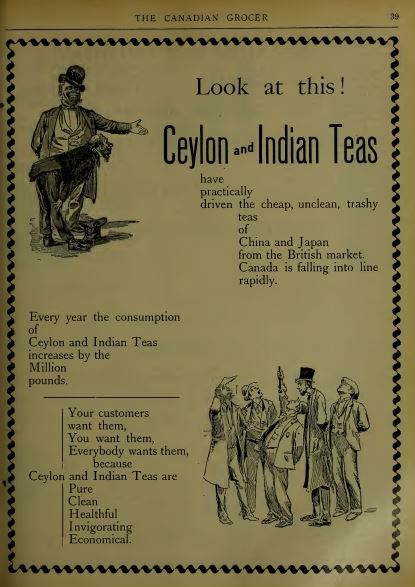 There seem to have been all sorts of brands and types of tea available in 1898 and it was coming from a variety of places – India, China, Japan, Ceylon (Sri Lanka). 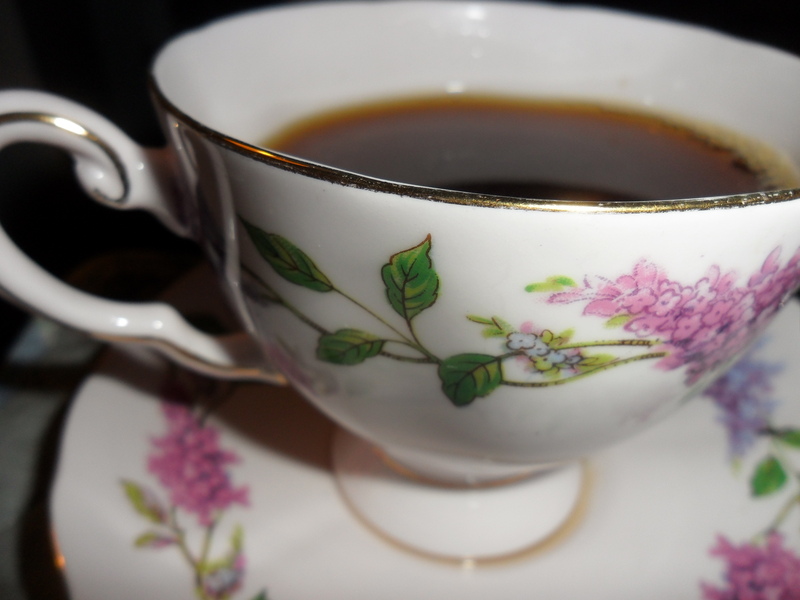 It’s possible that if you attended a tea party in some households you’d be offered a choice of China or India and you’d know the source of your tea. 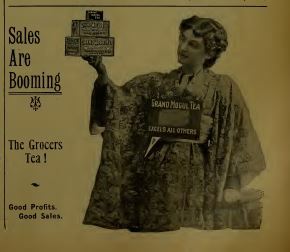 Here’s a selection of some of the ads appearing in The Canadian Grocer magazine in 1898. This was a trade magazine from Macleans Publishing aimed at people operating dry goods and grocery stores. In addition to ads from food manufacturers and distributors there were also ads for related equipment and dry goods suitable to the season. The spring ones had ads for brooms for spring cleaning and fly paper to prepare for the arrival of summer pests. Steeping the tea for 3 minutes made a beverage I could drink and 10 minutes of steeping was far too long. I’ll try somewhere in the middle for this particular type of leaf. Scald your teapot or teapots (some people use two) pouring the tea off the leaves before the flavor is spoiled by the tannin being extracted. Put your tea in the pot, the general rule being a teaspoonful to each person and one for the pot; pour the boiling water over it and let it infuse. A very nice way is to infuse it on the table under a cosey [sic]. The time allowed to infuse it is from three and a half minutes (time allowed in many London tea rooms, where the tea is excellent) to ten minutes. I think ten minutes is the time generally allowed. I bought some horseradish at the market on Saturday. Normally I see huge roots but now that it is spring they are much smaller and look more tender. I thought I’d try making the Horseradish Vinegar recipe from The New Galt Cook Book (1898). I’m pressed for time tonight so this one seems quick and since there isn’t a contributor associated with the recipe, it requires minimal research. I cut a chunk off the horseradish root and peeled it. Then I put my grater over a bowl and started scraping. I still remember the shock I experienced the first time I ever grated horseradish. I was working at a historic site and the gardener and I had just dug the horseradish. I wanted to see what it was like so I decided to prepare some grated horseradish to have on hand. Somehow the “radish” part of the word horseradish had never before jumped out at me so I didn’t comprehend what I was about to experience. I scrubbed the knobbly root clean and began to peel. So far so good. It smelled a little strong but it was okay. Then I began to grate the root and the tears began to fall. Chopping onions is not nearly as bad as horseradish. I was lucky and didn’t try to wipe my eyes with a radishy hand otherwise my experience would have been even more memorable! Clearly the spring roots are not nearly as strong. The skin was thinner and the root had that distinctive horseradish smell but it wasn’t as eye watering. I am not sure what I’m going to do with horseradish vinegar so I decided to make a very small batch. I had about 1 1/2 tablespoons of grated horseradish instead of 7 tablespoons so I decided to use just 1 cup of boiling vinegar rather than 3 pints (6 cups). I put the horseradish in a jar and poured the boiling vinegar in. I tasted a little before I screwed on the lid. So far the horseradish vinegar tastes mainly of vinegar with a hint of horseradish but I expect the flavour with strengthen over time. I’ve opted to leave the jar in the pantry rather than put it in a cool place. I’m starting to run out of room! Strangely the recipe appears in the Drinks section but so do chili vinegar and celery vinegar so I don’t imagine they are to be consumed as a beverage. How would you use horseradish vinegar? Seven tablespoonfuls of grated horseradish, three pints vinegar. Place the horseradish in a jar, add the vinegar boiling hot and seal tightly. When using drain off what is needed. Do not strain off the horseradish.